X.A.N.A. uses Kiwi to spread a virus which turns people into zombies. The zombies are all obsessed with doing our heroes in. The Academy becomes the scene for a real-life horror movie in which the character’s true personalities are revealed. Jeremy and Aelita are stuck inside the cafeteria, as much by the zombies as by William (who takes his role of protecting his fellow pupils a little too seriously). They must escape and get to the factory and deactivate the tower before it’s too late! A tower is activated in the Desert Sector, and on Earth, XANA’s smoke takes control of Kiwi, Odd’s dog. XANA uses him and bites Tamiya, the journalist of year 6, and she turns into a zombie, under the influence of a virus transmitted through Kiwi. The “zombified” student attacks her friend Milly who escapes in time. Running to the cafeteria, she screams for help and our heroes ask if XANA might be behind it. 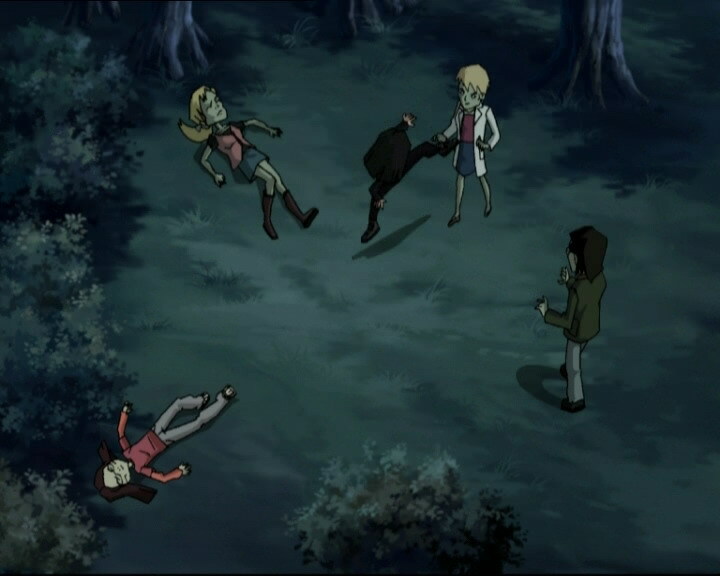 When Ulrich leaves with Sissi to look for the principal, they run into a pack of “zombified” students and teachers affected by the virus through the dog! The few survivors take refuge in the cafeteria, except for Sissi who flees into Kadic’s park and Ulrich who tries to catch up. 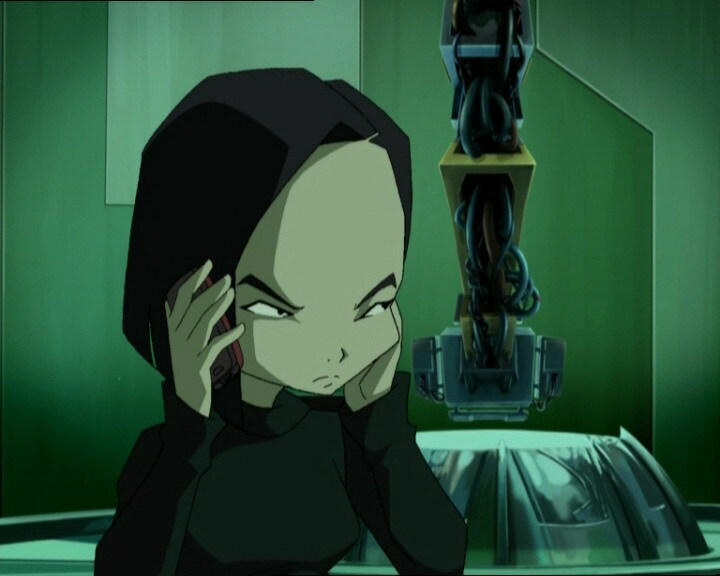 William tries to contact the police over the telephone and Ulrich warns Yumi. Trying to escape the cafeteria, Jeremy, Aelita and Odd are held back against their will by William who forbids anyone to leave the building! Having faced a few zombies in the park, Ulrich orders Sissi to return to the cafeteria, where she’ll be safe. In that same cafeteria, Kiwi sneaks in and Odd, unawares, is bitten by his dog. The boy begins to transform in front of the other kids, who jump on him and bind him firmly. 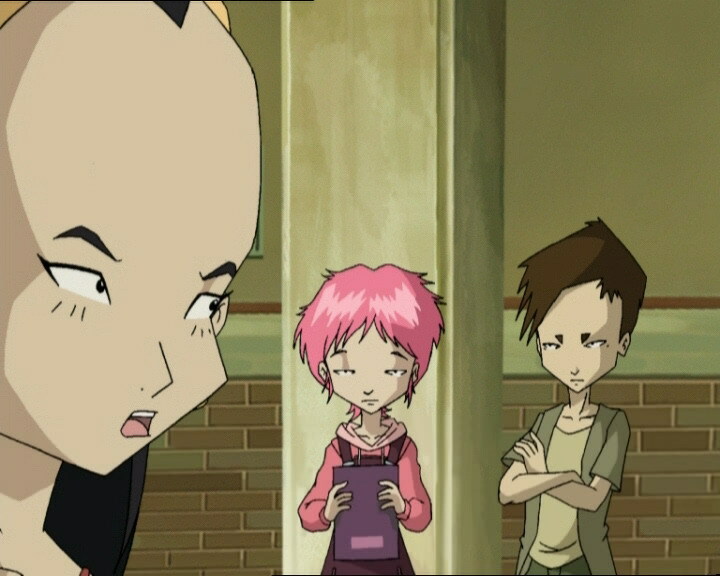 Despite all their explanations, William refuses to let Jeremy and Aelita leave. Worried about the idea of being “zombified” before launching the Return to the Past, Jeremy urges his friends to hurry. Yumi handles three Krabes but the Overwing is destroyed by a Kankrelat. 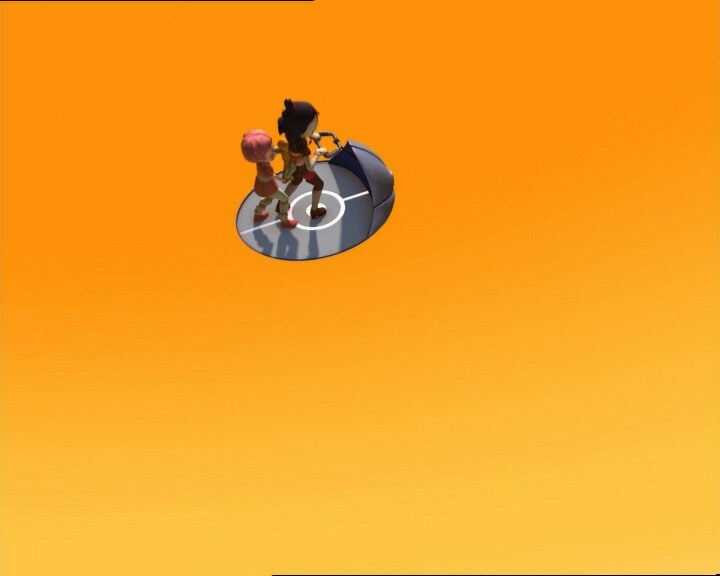 In addition, XANA hides the tower by making it and the surrounding terrain invisible. 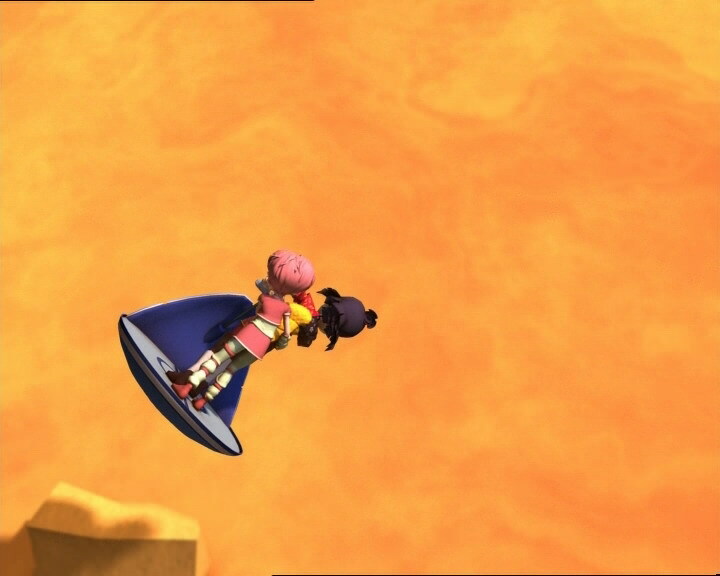 Aelita detects it with her sixth sense and Yumi transports her over the digital void with her telekinesis. On Earth, the doors give way and the cafeteria is invaded, only Sissi and Ulrich survive, forming a formidable defence. Not noticing the Kankrelat again, Yumi is devirtualised and surprisingly, Aelita lands on the invisible ground; XANA’s deception is now obvious. 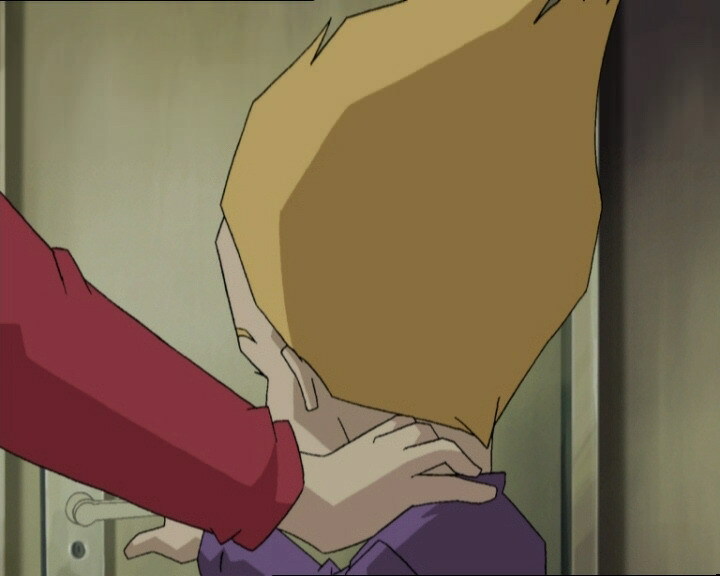 Aelita reaches the tower while on Earth, Jeremy is bitten by Kiwi. It’s while he’s being “zombified” and with a hoarse voice that Jeremy launches the Return to the Past. - Attack: Use Kiwi to spread a virus that “zombifies” people bitten, which XANA can then control. 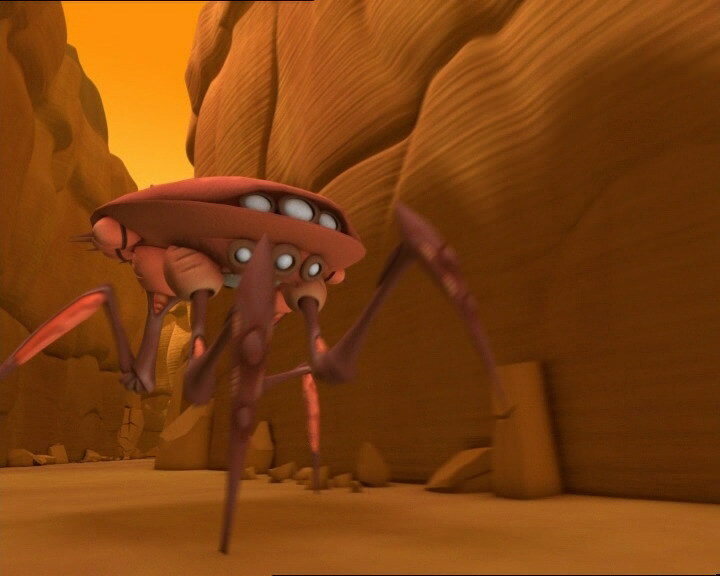 On Lyoko, render the tower and surrounding area invisible. - Return to the past to erase everyone’s memories and get rid of the zombification virus. - Discovery of Aelita’s sixth sense (allowing her to see the invisible tower). - First episode in which Yumi uses her telekinesis to move a person. - Odd is gifted in Italian, unlike Jeremy. - In this episode, Aelita uses one of Yumi’s fans. - Sissi is subscribed to a magazine called “Pretty Girl” and sleeps with a stuffed moose. - In the English dub, Milly asks Sissi what she thinks about her father setting up a language exchange programme with France, which is silly because they live in France. - The cafeteria doors change colour often (grey, green). - Christophe M’Bala’s headband is black during one shot in the cafeteria. 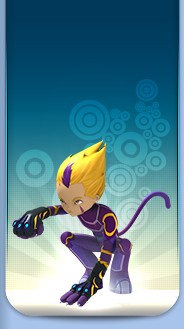 - Aelita’s outfit is reversed when she enters the tower! - When Yumi leaves her house to go to the factory she’s carrying her bag, and when she arrives she doesn’t have it anymore. 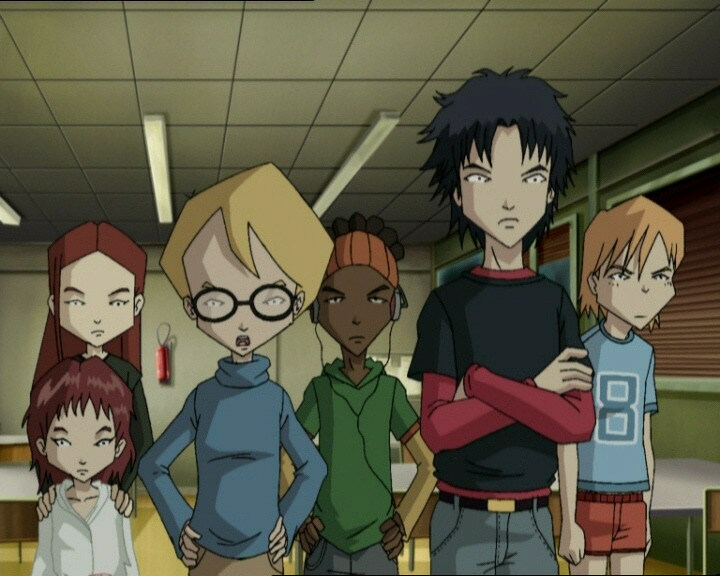 - Herb’s glasses aren’t the same when he tells William that Jeremy and Aelita are trying to get out, and his hair is entirely black after Milly says that she wasn’t lying about Tamiya attacking her. - In the very first shot of the cafeteria, we see that it’s daytime even though the kids are having dinner. - First time XANA makes an activated tower invisible, which it does again in episodes 47 “Tip-Top Shape” and 74 “I’d Rather Not Talk About It”. - Only episode in which we see Aelita’s sixth sense (allowing her to see the invisible tower). - New allusion to Dr Schrank from the series Hospital of Horrors. - XANA’s spectre leaves the lamp on Odd’s desk just like in episode 31, “Mister Puck”. - Yumi says a precognitive phrase about the vehicles: "Soon we’ll be landing right on top of them!" 16 episodes later, she and Aelita virtualise directly above the Overwing. - This episode suggests that a majority of staff sleep at Kadic as well as Jim. 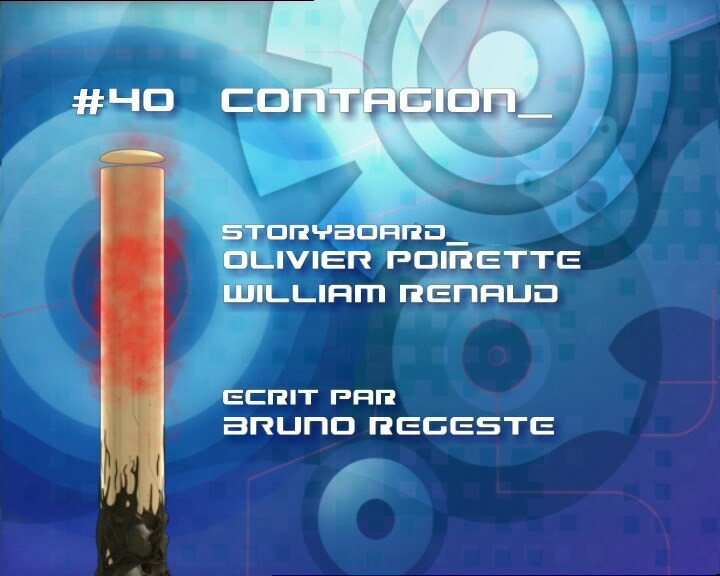 Rouiller, Fumet and other teachers are present when this episode takes place at night. Bruce Willis, an American actor, has played three roles in films in which he’s humanity’s saviour. Jackie Chan (born Chan Kong-Sang) is a well-known actor, martial artist and stunt performer (among other things) from Hong Kong. He’s starred in many films and had his own animated TV series Jackie Chan Adventures. - XANA’s technique is directly inspired by modern films about zombies in which the monsters infect healthy people through biting them. The most prominent examples are the “Resident Evil” video games, adapted for cinema. Yumi: So how’d the Italian test go? Jeremy: I couldn’t string two words together! Odd: Sei veramente nullo in italiano mio caro Jeremy! Odd: It means you’re really lame at Italian, Jeremy old buddy! Jeremy: You see? I didn’t even get that! Sissi: And anyway, I don’t need the whole school knowing what I think, understand?! Odd: No danger of that, Sissi, you’d need a brain to think! Jeremy: But I didn’t say that Kiwi was stupid! Odd: Oh no, you said he was brainless! Odd: Well neither would you! Does that make you brainless?! Odd: So you’re not going to be finishing your chocolate pudding? 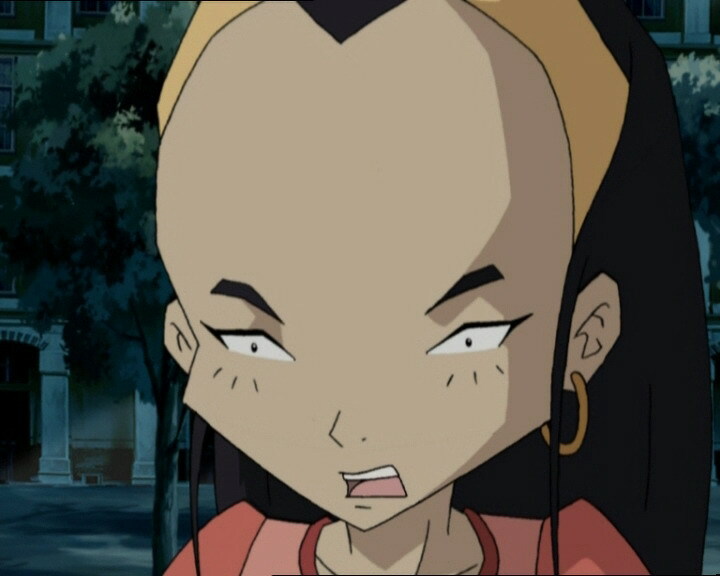 Aelita: Isn’t that your fourth one? Ulrich: Odd is like a cow, he has more than one stomach! Odd: The better to pig out with, my dear! Odd: The psycho TV brain surgeon in Hospital of Horrors! Hiroki: Was that Ulrich, your boyfriend? Yumi: Hiroki, for the hundred thousandth time, he is not my boyfriend! Hiroki: Yumi’s in looooove! Yumi’s in looooove! Yumi’s in looooove! Mr Ishiyama: Hiroki, leave your sister alone! Rosa: Hey, what’s goin’ on? Odd: Oh, nothing! We’re surrounded by zombies, ma’am! Nicolas: The problem with the living dead is that you can’t kill them. Because they’re already dead, hehehe! Odd: Oh great, William thinks he’s Bruce Willis, that’s all we needed! William: A Supercomputer that lets you go into a virtual universe where you have to battle an evil enemy called XANA? Aelita: If you want to stop this zombie attack, Odd, Jeremy and I have to get to the factory right now. William: Look, I’m sorry, but I don’t believe you, so we’re all staying together! Odd: Hey, Jackie Chan, so you think you’re the boss around here or somethin’? William: Yes! And I want us all to get out of this unharmed! Odd: You’ve gotta stop watching those superhero films! They’re getting to your head! William: You’ll thank me when you get out of this safe and sound! Jeremy: Safe and sound? Yeah, thanks a lot! Yumi: What in the world have you guys been up to? I’ve been waiting for you at the factory! Ulrich: Haven’t you heard? It’s a living dead convention over here! Ulrich: Kill the zombieeeees! Come on, you deadheads! Nyeh nyeh nyeh!!! Sissi: Open up! It’s me, Sissi! Hey, open up, I said! I’m not one of them! Herb: She’s lying. Prove it! Sissi: Um…I uh…I have a subscription to Pretty Girl and I still sleep with Ninin my stuffed moose! Herb: That has nothing to do with it, that just proves you’re a lame-o! Sissi: You open this door you bunch of pea-brained dorks!!! Nicolas: Ok, that’s Sissi, alright! Ulrich: That one’s on me! Jeremy: Virtualisation! And here’s the Overwing! Yumi: You’re getting better, Jeremy! Soon we’ll be landing right on top of them! Aelita: Oh, Krabes also in sight! Yumi: What do you mean? Jeremy: You’ve gotta deactivate the tower fast! If I get zombified, I won’t be able to launch the return in time, and then…tch…I don’t wanna talk about the mess we’ll be in! Sissi: Don’t you touch Milly, you hear?! Ulrich: It’s true that she’s a pain, but you know, deep down, I think she really likes you. 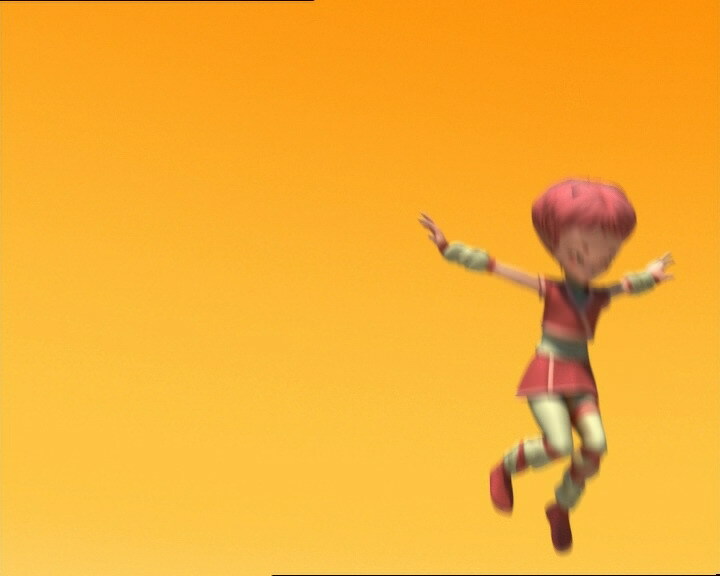 Aelita: And I really think that she can be very brave and a real nice person, when she wants to be! Jeremy: Yeah! In fact, you never can guess a person’s true colours, can you?